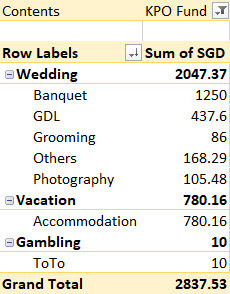 Our expenses are probably going to get higher and higher over the next few months due to our wedding (made lots of final payment on October) + our honeymoon trip to the United States. You can read about our wedding expenses here - Our Wedding Expenses is Within Our Budget! In addition, we are already thinking of buying these things in the US (KPO - GoPro HERO 7 Black and CZM - Dyson Airwrap) besides whatever "cheap" branded things we can find in the outlet malls >.<"
You can read more about how we manage our finances here. Removing our shared expenses which come out of our mutual fund (KPO Expense Fund), my expenses for September would be $4,430.51 - ($2,837.53 / 2) = $3,011.75. GDL - I blogged about this previously. We were wondering how much Pin Jin/Dowry CZM's parents will take, turns out it was really within CZM's expectation. lol. Besides the red packets, other expenses came from 2 bottles of red wine, oranges, etc. Grooming - I bought a box of contact lens ($56) while CZM bought a pair of earrings ($30). Others - We bought lots of random stuff that all adds up eventually. Photography - These were the shipping costs incurred from using Photobook. It was supposed to be cheap until we realized that you cannot ship them in 1 order. Having said that, it is still slightly cheaper than the others. Book some accommodations for our US trip and the transport cost was incurred from a cab ride back home from the airport after our New Zealand trip. Treated family and colleagues to food/drinks. It was a 50 cents donation when I met a friend doing flag day fundraising for animals - CAS Animals' Day Out 2018. To be honest, I had no idea which organization it was until I did some research while writing this article. Now that I know, shall share about it here - CAS (Causes For Animals) is an animal welfare charity set up to support the needs of local animal welfare in Singapore.